I’m not bashful about my favorite vegetarian burger recipe but I think it’s important to keep a few extra recipes in my back pocket for those times I don’t have all the ingredients on hand. These have been my favorite black bean burgers through the years. I use an extra step of baking the black bean burgers before frying or grilling which helps create a crisp outside (and a burger that grills a bit easier than others). If you have trouble grilling burgers, I recommend picking up a grill pan. It’s easier to grill the burger but still gives you that good grilled taste. 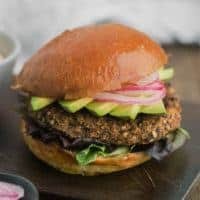 This easy and filling black bean burger is the perfect vegetable burger to make ahead, freeze, and grill up whenever you need a quick meal. In a food processor, pulse garlic until minced. Add in the carrot, onion, red pepper, and jalapeño. Pulse a few more times until everything is in fine pieces. Add in the oats and pulse until the mixture is combined and the oats are broken down. Add in the black beans, spices, and egg white. Pulse a few more times until the mixture comes together but there are still small pieces of black beans. Let rest for 20 minutes. Heat oven to 375˚ and line a sheet tray with parchment. Wet hands and divide patties into 4 balls. Press into 1/2″ thick patties and place on the sheet tray. Back for 14 minutes, carefully flipping halfway through. Finish the burgers by searing for 3 to 4 minutes in a pan with a bit of oil or on a grill that has been oiled well. Tips & Tricks: Don’t puree the beans- there should still be small pieces of black bean visible. A few people have made this and ended up with a loose dough- make sure you drain the beans well. This is a solid base of a burger that is good as written above but can easily be upped in the flavor department. 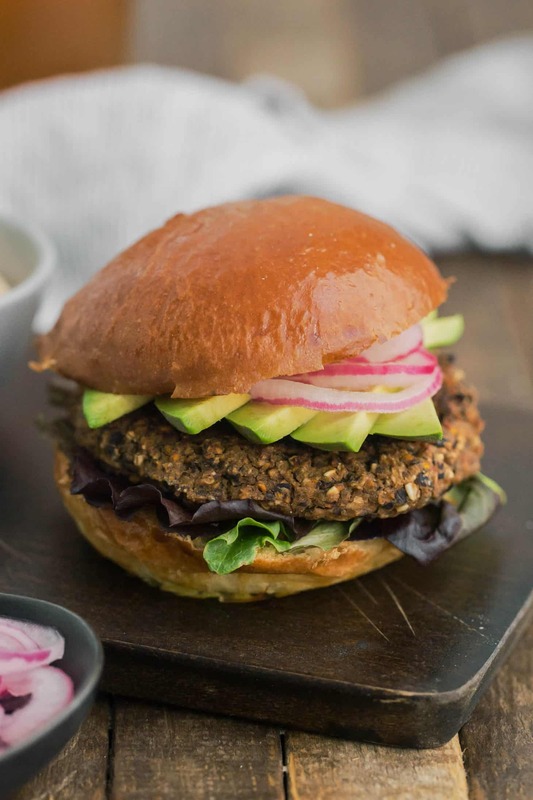 These black bean burgers also work really well for quite a few different toppings. This particular version I used chipotle mayo, pickled onions, and avocado but I also love this burger with a sweet corn relish or grilled zucchini. Herbs: If you have them, fresh herbs are a nice addition. Cilantro, parsley, or basil work best depending on the flavors you want your burger to have. Add 1/4 cup or so of fresh herbs to the mixture before the final pulse. Vegetables: If you want to swap around the carrots and peppers I recommend using sweet corn, beets, or roots vegetables (like parsnips or turnips). You can also grill/roast the vegetables ahead of time to add an extra layer of flavor. Seeds: I like a bit of crunch in my burgers and if you’re with me, trying adding 1/2 cup of nuts or seeds like sunflower, pepitas, or pecans. 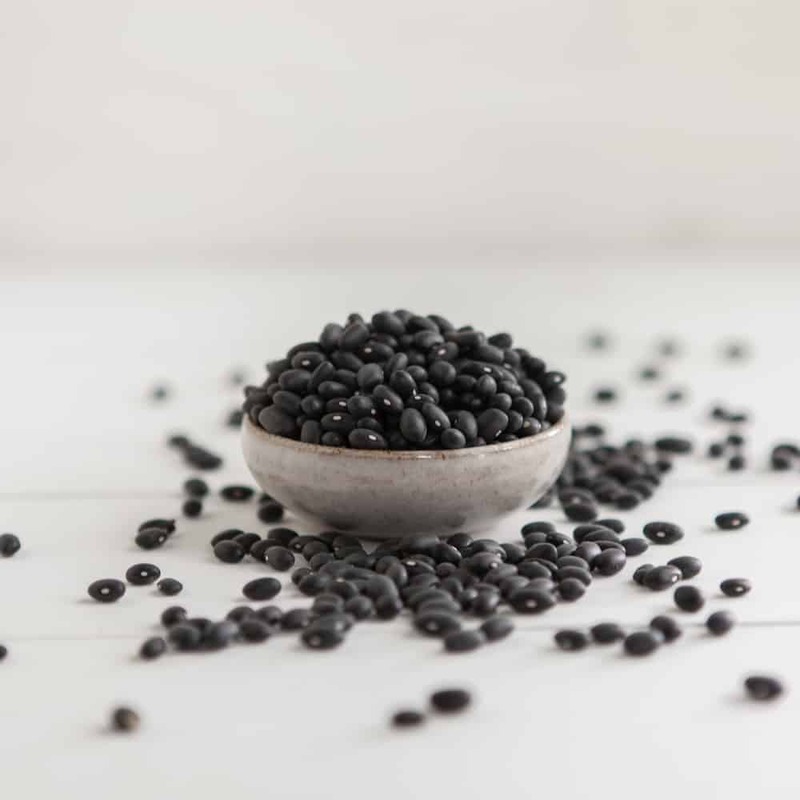 Black beans are one of the legumes we always have on hand. It’s my go-to taco and quesadilla filling as well as the perfect topping for grain bowls. I usually cook up a big batch on the weekend then freeze to use for a couple of weeks, thawing as I need beans. Recipe first published on June 10th, 2010. Last updated on June 28th, 2016. 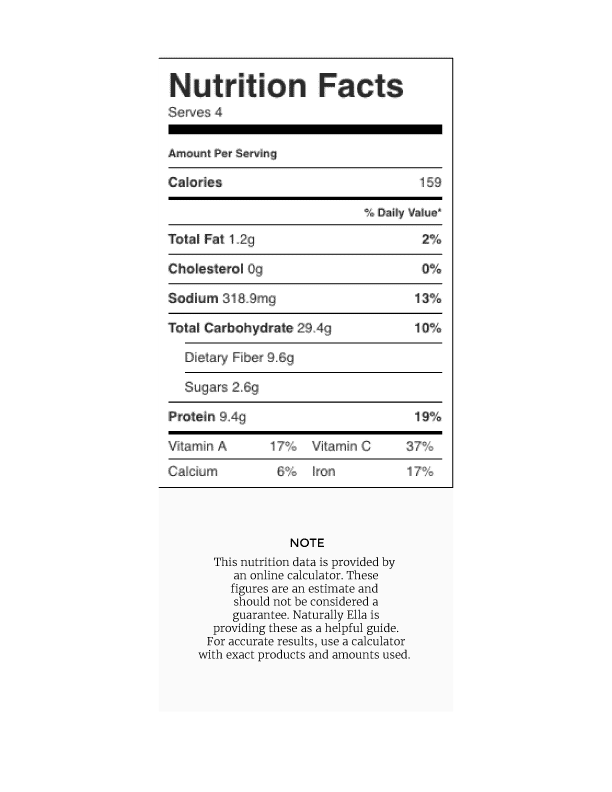 Looking for the old version of the recipe? Find it here. 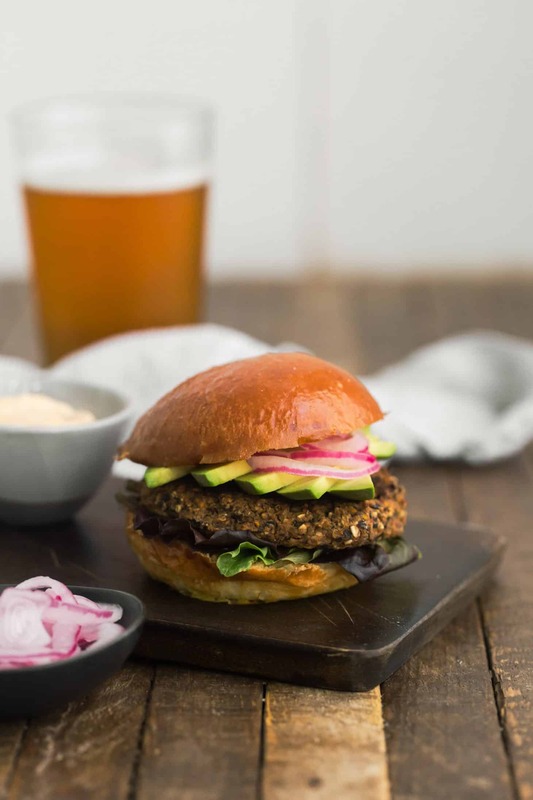 I love black bean burgers…this is an awesome recipe that i would love to try. Whenever i make them at home they always tend to be very mushy but we eat them anyway. The key is to put them in the fridge….thanks 4 the tip!!!!! I just tried these,turned out very runny. Is the can of beans supposed to be drained before using? Flavor pretty good, but extremely runny. Yes the black beans are supposed to be drained and rices before adding to the other ingredients. I hope you make them again, they were delicious! Thanks so much for sharing this YUM recipe Ella! *oops, I meant “and rinsed”!! Super runny. Impossible to make patties, even if you rinse and drain the beans. I added twice the oats to try to thicken it. Still running as all hell. Thumbs down. Loving this recipe! I would add ALL of the variations, to be honest. Especially the herbs! Any thoughts on using Canellini beans instead? Thanks! Unfortunately I had the same problem as others before, the mixture was not thick enough, I couldn’t form patties. I heaped it in the pan with a tablespoon, but it was very difficult to turn them, then. The taste was very good, but the texture was a total failure. I stored the mixture in the fridge for few days and it leaked a lot of water everyday. In the end it was still way to runny :(. Hi Lena, So sorry to hear that- I actually *just* updated this recipe a month or so ago and tested it again. There’s hardly any liquid in the recipe (just the egg white), so I’m really not sure where the problem is coming from. What kind of beans did you use? Homemade or from the can? Mine came out perfect!!! I didn’t blend/chop the black beans at all and put them in a strainer. Mine were not at all runny. Also, I didn’t have parchment so I used foil and put them in the fridge to cool before taking them off the foil. I also forgot to flip them and insead just cooked for 16 min and didn’t sear them. I’m excited to try more variations!! I didn’t have black beans, so I used kidney beans. Worked perfectly. Amazing flavor, and actually surprisingly easy to make. I think I pulsed in the food processor a few times too many, but will remember next time to use a lighter hand. Crisping them is a MUST! I loved the nice crispy layer after searing in a pan with some olive oil. I served my patties over fresh baby spinach and topped with fresh avocado and cucumber corn relish. I also divided mine into 6 rather than 4, and even considered making into meat-less balls. I can’t wait to try other variations with lentils or other beans and herb combos!